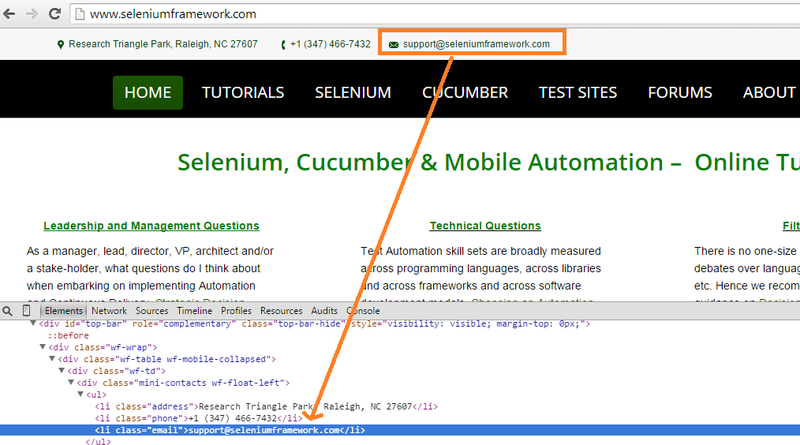 Selenium Framework | what is Page Object? When we interact with web pages on a browser and have to interact with an element on the page, we find the element using selenium api (remember find elements section) and perform an operation on it. The concept of page object is to be able to have the element initialized by the time we want to interact with it, so that we don’t have to dig into the DOM every time we need to interact with it. The concept looks awesome and one might think – well, then all I have to do is to create a class, have the html elements as its members and probably have some methods of the class as keywords [yes the same keywords we talked in keyword driven framework]. And yes, that is where we will start ! The agenda topic span across multiple pages, but will remain under the section page object framework in the menu on the left. So please navigate to the next page once you reach the bottom of this page. Similarly in the above picture, we have address element which has class=”address”. Similarly in the above picture, we have phone element which has class=”address”. So if we go ahead and represent this as a class, it might look something as below. This represents the page-object for seleniumframework home page. As you can see above, we have a class defined with html locators as members of the class and getters and setters for each of those WebElements.Obviously this is not the most mature way to represent the page-object, however I believe you get the idea here. So we have seen how to implement an extremely easy page-object pattern here where we represented the home page. This way, we can go ahead and represent the web pages with page-objects and use them in step definitions and interact with them. Is it so simple ? Do I initialize the elements in the constructor always ? The instances of the classes (sf) – How many instances do I need to create and how do I keep track of them ? We know that there are some commonalities across all web pages – For example , the driver object applies to all web pages. Can I abstract it out ? Can I declare a base page? Can all my web pages inherit from base page ? All of the above questions are valid and there are more. Let’s take it step by step and by the end this tutorial on page-object framework, I am sure you will appreciate some patterns we talk about here.